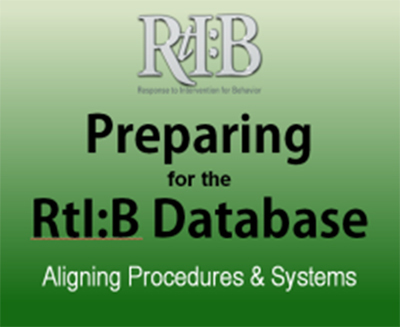 The RtI:B database is available free of charge to any public school in Florida. An email from a district administrator expressing interest and/or support for using the database. 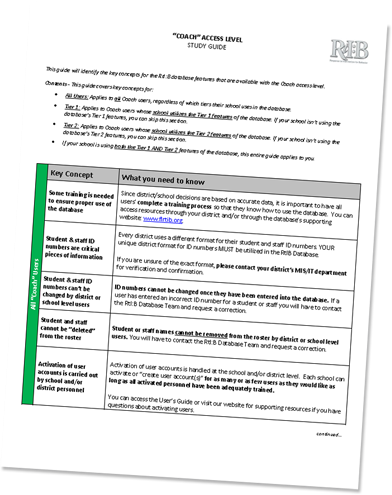 An email from your school principal expressing interest and/or support for using the database. A member of the database team will email you back within one business day to schedule a phone call with you and any other interested staff. During the call, we’ll answer questions, provide suggestions to help you introduce the database to your colleagues, and make sure everyone knows how to access appropriate training and support. You can get a jump start on this by reviewing our planning section. The amount of time required to activate your account(s) will vary depending on the features you plan to use. 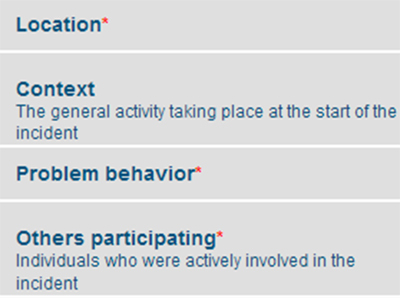 Simple activations can take place the same day as the planning meeting, while complex situations may take a few weeks. Once your school account is active, you’ll be able to give immediate access to as many individuals as needed. 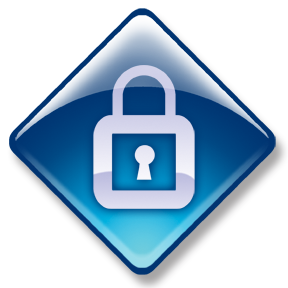 Multiple access levels provide flexible options for sharing information and managing school and district accounts. These default permission sets can be further tailored to address the individual needs of a user. See what we mean by minor, major, and SESIR behaviors, and understand the differences between similar offenses at these levels. 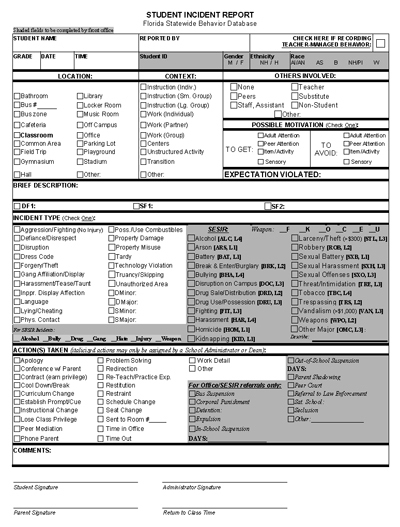 This list allows you to see required information and the different choices available during incident entry. Feel free to adapt this form to fit the needs of your school. It’s available as a Word document or PDF, and is completely aligned with the database’s requirements. District-level IT/MIS personnel can upload student and staff lists for their schools, and update them as much as needed. Review the formatting requirements for student and staff lists, and when you’re ready to upload the files email the database team to obtain your log-in information. This session describes the different features of the database and outlines some key considerations for using the system (May 2012). WHO: School and/or district administrators are responsible for giving other properly trained staff access to their school’s account. HOW: When a school account is activated, primary users will receive an email with their log-in information and may begin “activating” other users. There is no limit on the number of people who can log in to the database, and multiple access levels are available so information can be obtained on a “need-to-know” basis. 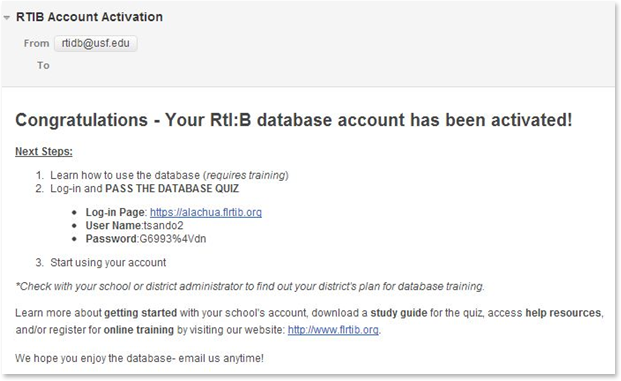 WHAT: After receiving their activation email, all users will need to pass the database quiz before they can work with their school’s information. The quiz is specific to the school’s tiers of use and the individual’s level of access. Study guides are available on the “New Users” tab. Passwords are case-sensitive, and contain letters, numbers, and special characters. Copy/paste your credentials into the log-in fields, and if that doesn’t work try typing them in by hand. Use the “Forgot Password” link to get a new (sometimes easier) temporary password. Email the database team for help – we’re here to support you! All users will be required to pass the database quiz before using their accounts. Talk with your administrator about your district’s plan for database training, or visit our training page for live webinars and recorded modules. Study guides are available to prepare you for your quiz. 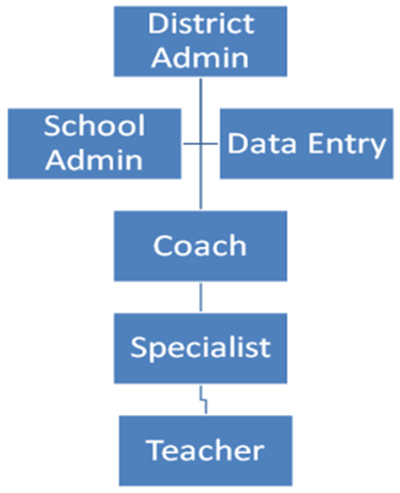 Your questions will depend on your access level, and the tiers your school will use in the database. Check with your administrator if you’re unsure of this information.